P21S Polishing Soap - State-of-the-art German metal-polishing technology is now available from P21S. State-of-the-art German metal-polishing technology is now available from P21S! If you can’t tolerate the harsh smell and irritating chemicals found in most metal polishes, you may have tried all sorts of alternatives. Lemon juice is a popular home remedy, or maybe toothpaste. The fact is these household items don’t do the trick on tough tarnish and rust. But there is an alternative to overpowering polishes. P21S, has just introduced P21S Polishing Soap, the first and best metal polish in the form of a pleasant-smelling, non-toxic soap. Custom metal rims and trim are the latest craze for enthusiastic drivers. P21S is the perfect polish to maintain that high-impact gleam. Just wet the applicator sponge included with each jar of P21S and drag it across the surface of the white cake. Squeeze the sponge to create a rich lather and rub onto the metal surface. P21S Polishing Soap doesn’t require a lot of pressure; it does most of the work for you. When you’ve finished polishing, rinse with water. Tarnish, rust, and filth will literally vanish. Your wheels and metal trim will look even better than new without scrubbing and without a pile of dirty towels. Just rinse out your sponge and let it dry before putting it back in the container. P21S Polishing Soap is recommended for exhaust pipes, handlebars, headers, spokes, forks, polished wheels, polished casings, and exhaust tips. All the metal on your vehicle will sparkle. Don’t overlook the tip booklet included under the sponge. It has helpful hints to ensure you use the product correctly and to help you troubleshoot any problems you may encounter. For example, if your cake of polishing soap dries out because the lid wasn’t secure, just wet the top of the cake and use as directed. P21S is not only easy to use, it is non-toxic and environmentally safe. Unless you have an allergy to soap or fragrance, this product will not irritate you. In addition to automotive uses, P21S is incredibly effective on your metal utensils and cookware. Use it on stainless steel and aluminum pots and pans, faucets, boat hulls and railings, glass, stove tops, ceramic tile- even tennis shoes. After all, it is soap. This metal-polishing technology is a favorite in Germany and has just been made available in America by P21S. Once you try P21S Polishing Soap, you’ll never buy another metal polish. 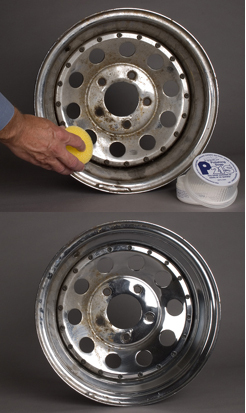 Do not use on painted, anodized, or clear coated wheels. Manufactured in Germany. 10.6 oz. This item cannot be shipped to Europe or the UAE. Ineffective and require multiple applications to achieve the desired results. Best stuff I have used. I have used a few different products on my exhaust to try and keep the soot off. Nothing really worked till now. This stuff is fantastic. I used a couple squirts of water on the included sponge, wiped it over the soap twice and went to work. I am not sure the exhaust tip inside and out looked so good even new. ProsOne can should last a lifetime on just exhaust tips. On your headers or exhaust tips, then scrub it off. This product was interesting, and luckily I chose the most cost effective version of all the copy-cats out there (some of which double the price of P21S). In the end, it just didn't work well. It was able to get the top layer of really bad corrosion and exhaust debris cleansed from tailpipes, but for the real "polishing" and refining, it came down to the basics of a good traditional metal polish and and ultra-fine 0000 steel wool or foam buffing ball. Does a great job for stainless! I used P21S on my nasty 7 year old stainless steel exhaust tip. It brought it back to brand new status. Don't be fooled, you do still have to use a lot of elbow grease along with this product. I finished off the tip with Chemical Guys Extreme Metal Polish, and the tip is now to a mirror state.